Yesterday price reached level of 50% and my Take Profit was very successful. Earlier, Eurodollar rebounded from upper target levels and started correction. Probably, pair may rebound from level of 50% and start new ascending movement. 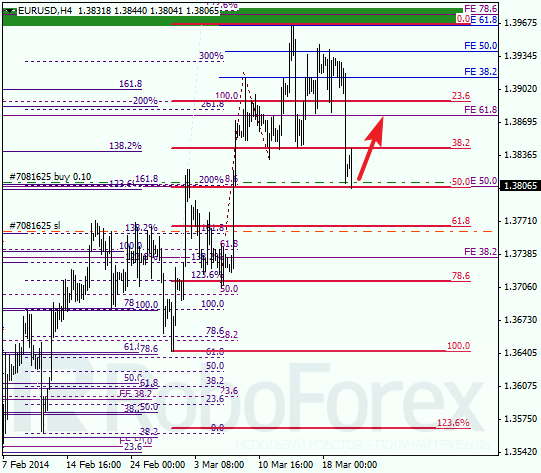 As we can see at H1 chart, price reached its lower targets right inside temporary fibo-zone. While price was rebounding from current levels, I opened buy order with tight stop. If pair starts moving upwards, I’ll move stop on my order into the black as soon as possible. 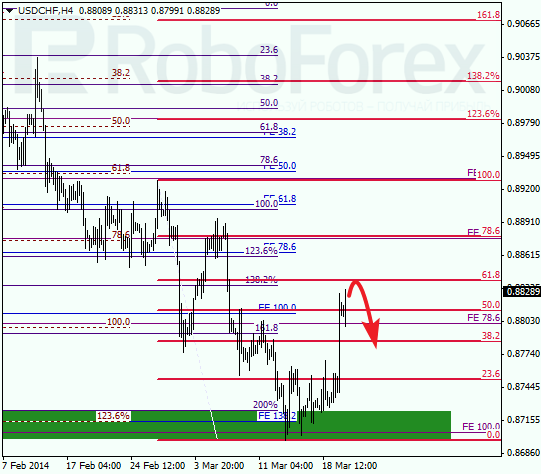 Franc made strong movement and reached level of 50%; my Take Profit was very successful. In addition to that, bulls are still pushing price upwards and may reach level of 61.8% quite soon. Later instrument is expected to rebound from this level and start new descending movement. At H1 chart we can see, price is getting closer to temporary fibo-zone, which means that pair may rebound from level of 61.8% during the day. After that, I’ll try to find opportunity to enter the market and start selling.